Product prices and availability are accurate as of 2019-04-19 12:39:43 UTC and are subject to change. Any price and availability information displayed on http://www.amazon.com/ at the time of purchase will apply to the purchase of this product. 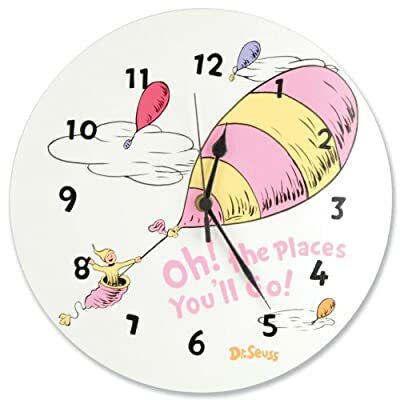 You and your child will love the Trend Lab 30069 Dr. Seuss Cat in the Hat Wall Clock. With its fun design and bright colors, this clock runs on one AA battery (not included). Easy to hang, the mounting hardware is mounted to the back for convenience. Formed in 2001 in Minnesota, Trend Lab is a privately held company proudly owned by women. Rapid growth in the past five years has put Trend Lab products on the shelves of major retailers, and the company continues to develop thoroughly tested, high-quality baby and children's bedding, decor, and other items. Trend Lab continues to inspire and provide its customers with stylish products for little ones. From bedding to cribs and everything in between, Trend Lab is the right choice for your children. Fun, Dr. Seuss-themed clock. Mounting hardware attached to the back. Easy to hang. Runs on 1 AA battery (not included). Measures approximately 10W x 11H in.. Round wall clock Includes second hand Runs on one AA battery (not included) Dr. Seuss Oh the Places You Will Go!